A fearless card player is on an ”unprecedented” run after winning a staggering $15 million (USD) playing blackjack. 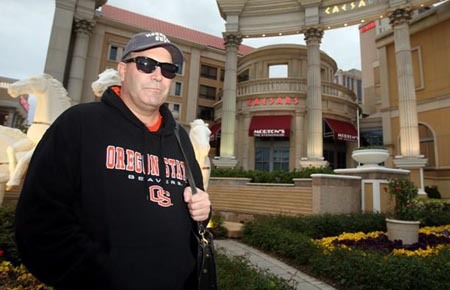 Don Johnson, 49, has spent the last six months cleaning out some of Atlantic City’s biggest casinos by netting millions of dollars at a time. He took The Tropicana for $5.8 million, resulting in the casino losing $1.8 million overall at the blackjack tables in one month. It is the first time a casino in Atlantic City has lost money in Blackjack over a sustained period since gambling in the town was legalised in 1978. Mr Johnson picked up $5million from The Borgata and and $4 million from Caesars. Mark Giannantonio, the Tropicana’s CEO, has subsequently been replaced although he denied it was because of the record loss. All three casinos refused to name the player until US businessman Don Johnson came forward and revealed himself. The Pennsylvania high roller, who started betting $25 USD a time 15 years ago, now wages up to $100,000 USD playing blackjack. Johnson has refused to divulge his strategy and will only reveal that he possesses a deep understanding of blackjack – the only card game where players can beat the house without luck.